Press File Photo Grand Rapids may seek a state grant to help fund 3.5 miles of mountain-biking trails at Richmond Park. GRAND RAPIDS â A state grant could speed development of a “grand loop” of area mountain-biking trails. Grand Rapids plans this spring to apply for two Recreation Passport grants from the Michigan Department of Natural Resources. One would help fund resurfacing of six tennis courts at Aberdeen Park, 798 Evelyn St. NE. The other would help pay for 3.5 miles of natural-surface mountain-biking trails at Richmond Park, 1101 Richmond St. NW. The project proposed at Richmond Park would be part of “The Grand Loop” that will enable riders to access a network of off-street trails via on-street paths, said Kevin Allen, president of the West Michigan Mountain Biking Alliance. “Why it’s so attractive at Richmond Park is because it marries with the urban bicyclist as well,” Allen said. “You can literally leave from your driveway and ride a little bit on the street and head out from there and hit some mountain-biking trails. 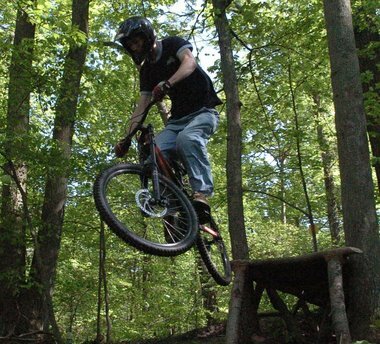 Existing mountain-biking trails in the city are at Ken-O-Sha Park, 3155 Kalamazoo Ave. SE, and Grand Rapids Bike Park, 580 Kirtland St. SW. There also are existing trails at Richmond Park “that are not very sustainable,” Allen said. “Our goal is to redesign those trails and make them something that everybody can use,” he said. The Passport grants, which are funded by sales of $10 recreation passports sold by the Secretary of State, will range from $7,500 to $45,000 this year. Recipients must pay at least 25 percent of the total project cost. The mountain-biking alliance will provide matching money for the Richmond Park trails, while Grand Rapids Tennis Patrons and Grand Rapids Public Schools will pitch in for the Aberdeen tennis courts, city officials said. “Those courts have been perpetually on the list” of park needs, said Steve Faber, Friends of Grand Rapids Parks executive director. Unlike some parkland development monies, the passport grants are a way for the city to get money for upgrades to existing parks, he said. City Commission is expected to hold a March hearing on the grant applications. Grand Rapids last year got two $30,000 Passport grants: for basketball court and restroom improvements at Martin Luther King, Jr. Park, 800 Fuller Ave. SE, and for playground upgrades at Roosevelt Park on Grandville Avenue SW. The local match for each of those projects is $15,000. Email Matt Vande Bunte, or follow him on Twitter.